How your messaging is displayed in the Search Engine Results Page is very important. It’s your first impression towards potential website visitors. 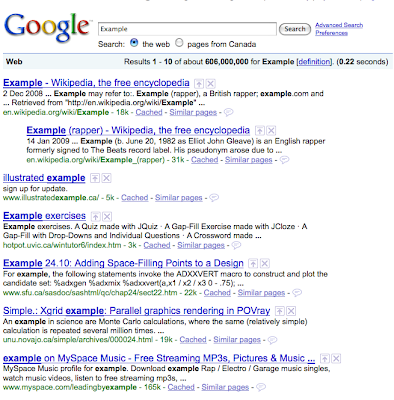 The Search Engine Results Page is the page on a search engine with a list of links to websites, their descriptions, and their URL. The blue underlined text is the link to the website. It is the page title on your website (what displays at the very top of the browser title. Google indexes the first 70 characters of page titles. The black text is your meta description. Google will display the first 150 characters of your meta description. However, if your meta description is not relevant, Google will just grab some text from your website that it does think is relevant. The bold words in the page title and meta description are the relevant keywords that Google has found. In the example above, I searched “example” and so it is bolded in all of the results. The green text is the URL of that page that Google is displaying. For SEO, Google looks at all of these things! But if you cram keywords into your page title and your meta description, things will just look ugly! Treat your URL like a headline. Include your company name in your page title. Consider asking a question that will draw interest. Include a call to action (“Visit our website,” “See our Knowledge Centre,” etc.) in your meta description. Use only your most sought after keywords with their modifiers, so that they don’t turn your page title and meta description into a nonsensical list of keywords. Remember, your display is like an advertisement… but you may not want to treat it exactly like an ad. If you’re only getting people looking to purchase something, then go ahead: give ’em an advertisement. But if they’re looking for pure information, they will be turned off by anything that looks like an advertisement. So be careful with your page titles and your meta descriptions, and always keep the end goal in mind.